Dreaming of Footpaths: Am I just revoltingly sweaty? I was having a conversation with a couple of other girls in the gym at lunchtime. A nice normal post-workout out chat but all of a sudden they dropped a bombshell. Apparently they don't wash their gym kit after every use. I couldn’t quite believe this so double-checked and they confirmed that they kept the same kit and washed it every 2 or 3 workouts. I looked at myself. Post-workout, sweat dripping off my elbows, rat-tail hair and couldn’t imagine having to put this kit back on without giving it a really good wash. Or possibly burning it. So question. Am I just a REALLY Sweaty Betty? Do you wash yours every time or do you try and make it last for a few sessions? The kind of person who ‘glows’ instead? And yes ... I probably am that minging person next to you at the spin class who drips sweat on the floor and looks as though they’ve been dipped in oil. No. Don’t come and choose the bike next to me unless you REALLY like having other people’s sweat on you. What can I say? I have limited gym time, I try and make it count. Yep. I bet the cleaners at the gym HATE me. So … wash every time … or not? Take my quick survey - I need to know I'm not the only sweaty girl out there!! What the actual feck? If you don't need to wash your kit you're not working hard enough! Erm.....kind of have to admit that I don't wash my kit after every run. And I sweat. A lot. Don't look at me like that. All my t-shirts are technical and therefore wick most of the sweat away, right? If I washed every piece of kit after every run......well, I'd never have time to go for a run because I'd be forever doing laundry! 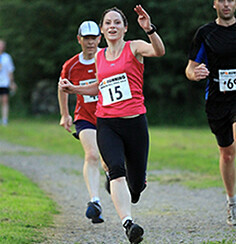 Know what you mean about the laundry though … it is the downside to running. 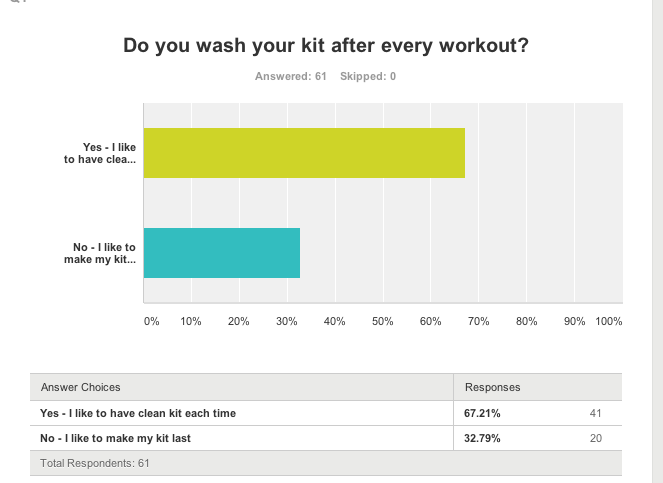 I wash my main kit after EVERY SINGLE WORKOUT, although I do hang my sports bra up to dry out before a second use. I only have three sports bras and when you're doing some form of sweaty workout 8-9 times a week that becomes a lot of washing! I heard somewhere that you're supposed to hand wash all your bras including sports bras … seriously how much time do these people think we have?? If we did that we'd spend more time washing than running!! Yep - I use that excuse too!! I have a load of workout gear now! I do find washing it every time does tend to destroy it pretty quickly but the upside is that at the start of the workout I smell nice … even if by the end I'm revolting! Seriously if they can wear tiny hot pants without a) getting a serious wedgie and b) melting them then they just aren't working hard enough! And yep - LOVE that saying!! That's AMAZING! Can relate to that having to use the old 'cup of white vinegar in a wash' trick myself to save being known as Stinky Sarah! Memo to self: try the 'cup of white vinegar in a wash' trick. Lol and lol, I am the human fountain in the qym!! !